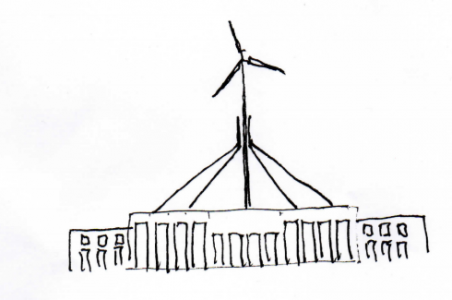 DeFrock realises that there are country Australians in every State involved in resisting and fighting the wind industry along the whole chain of the development of a wind project. This effort, as results show, is a lonely and unproductive activity, virtually always resulting in a win for the developer. Part of the reason for poor returns for the efforts of the locals is that they are slow to realise that they are facing a life destroying juggernaut: that they need to organise and become very well informed; that responsible bureaucrats are great supporters of renewable energy at all costs, and are deliberately blind, even hostile, to the complaints of those suffering from wind projects. The development “process” starts with the would-be developer using well-rehearsed partial truth sales discussions around farmers’ kitchen tables designed at securing turbine sites. This stage is shortly followed by well publicized but small donations to local clubs and charities. Perhaps even a developer-sponsored public meeting, although developers are increasingly side–stepping these as communities become better informed. For developers time is much better spent in “bending” local councils. The process then moves on to a Planning Application from the developer to the Minister, followed by a Planning Panel Hearing and, finally, a Panel Recommendation to the Minister. It is the Minister’s responsibility to choose the Members and Chair of a Planning Panel from a list managed by Panels Victoria. Understand that virtually every Panel has recommended to the Minister that a proposed project should proceed. DeFrock contributers have attended Planning Panels. Here are some suggestions on handling Panel hearings. The suggestions are largely based upon: the inevitable outcome; the lack of sworn evidence from the developer’s experts; and the apparent illegality of instructions to Panels. Objectors should recognise the outcome is inevitable, so the basic objective is to disrupt the hearing by introducing, in as forceful manner as possible: the deliberate lack of sworn evidence; the possible illegality of the process and therefore findings; use of known to be irrelevant noise guidelines; contravention of human rights of neighbours and possible liability of Panel members. Finally indicate that regardless of the Panel’s recommendations and the Minister’s issue of a permit, the wind project developer and local and other responsible officials will find themselves defending the indefensible in court and facing very substantial damages claims. After some recent findings by a consultant in relation to noise from the Bald Hills project, the confidence of developers in “deep pocketing” potential litigants is on the downturn. agree that the objectors will operate as one on constructing the general objections common to all wind projects (this material is largely available) and that one person, most importantly a lawyer, will present these general objections to the Panel in as hard hitting a way as possible. Remember friendliness and politeness will only be taken as weakness. The process of generating permits for new projects is different in each of the States. What is common is that there is overwhelming bias in the process against the objectors and in favour of the applicant. The lawyer for the objectors must make this point as often as possible, including noting that the bias is expressed in noise guidelines, in responsible officials presenting closed minds to clear scientific and technical evidence, ignoring existing legislation where it is in conflict with guidelines, and in press reports and articles. Local objections should then be made by individual objectors. Even in this category, work together to co-ordinate your objections. In this post the Victorian situation is used as an example. DeFrock is hoping that it will be asked by knowledgeable others to publish prepared material relevant to their States’ procedures. It has been the practice of objectors to spend considerable time and money on their objection, often repeating what others have already said in their presentations. Curiously the applicant never exposes itself to cross examination, but thrusts its not-on-oath experts forward to make the case. Even more curious, the Planning Panel members are selected and instructed by the Minister, report to the Minister and then disappear. Not so curious is that in Victoria there have been about 30 Panel hearings with only two recommending that a project not proceed. The first of these two failed project applications did not proceed, but the careers of the members of that Panel seemed to falter thereafter. Get used to labelling Panel hearings as “for show” hearings and calling them just that. Be firm and strong when presenting to the Panel and remember that the Chairperson, Panel members and the would-be developer’s staff or experts and the relevant Department’s officers are not your friends. They all know the hearing is a charade. Panels are not independent of the Minister. The instructions of the Minister to Panels and the findings of Panels is often in apparent conflict with existing Victorian law. Detailed complaints on this matter have been ignored. A future post will describe the possible illegality of the process and the findings. A particular and seemingly illegal matter is that in addition to the developers, all the responsible politicians and bureaucrats know that the noise guidelines are technically irrelevant; and instead of protecting project neighbours, allow the reverse to happen. DeFrock advises that objectors not play the developers’ and bureaucrats’ game where the outcome will always be in their favour, but try to disrupt the “for show” process and try, as objectors, to construct their own field of combat. DeFrock advises objectors to start with the standard general objection, which will be outlined in another post, and tailored by the group lawyer. This standard objection is prepared and presented so that developers and bureaucrats cannot claim they did not know what was going on; and should be suitable for briefing lawyers for, say, a future court case. Local objections are of course where the objectors have the greater knowledge and therefore an advantage. Always prepare objections on the grounds that the information is of “go to court” quality.